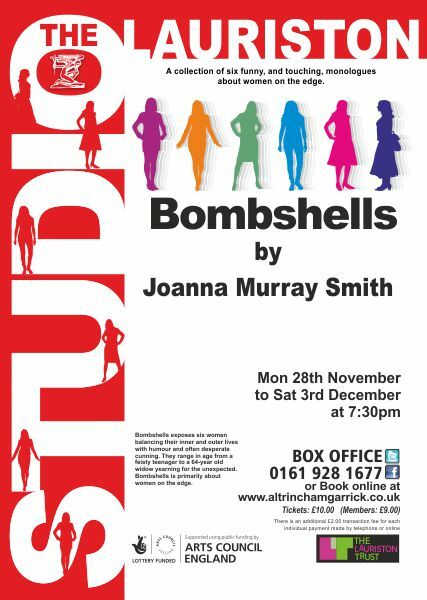 Bombshells exposes six women balancing their inner and outer lives with humour and often desperate cunning. They range in age from a feisty teenager to a 64-year old widow yearning for the unexpected. Bombshells is primarily about women on the edge. THE test of the six actors who perform in Bombshells, is to master the monologue. Bombshells by Joanna Murray-Smith sets the challenge. For, in six scenes , women from a teenager to a pensioner with very different personalities are introduced. Every scene is slightly linked. The first, Meryl, conveyed well by Emily Duffy, is a harassed multi-tasking mother of three. She rushes around achieving little believing other mums are better. Then comes Tiggy who ignores her feelings about her husband?s rejection, to concentrate on cacti. She presents in an eccentric way, a hilarious slide show about the spiky plants. Using facial expressions, and in one of the best performances, Jaqueline Wheble makes her character mad as a hatter. The Wannabe Star is played by Fiona Primrose, a schoolgirl who wants to win a talent show and ends up having to improvise. Fiona gets a laugh for her dancing! Next is a bride to be. Theresa has always fantasised about her wedding day, beautiful dress, etc. Reality dawns when she realises it involves someone else and he is not Mr Right. Vicky Siddle shows great skill when the pin drops. Then it?s an ageing widow, Winsome. whose dull routine with other widows enjoys a rude awakening after she has read a raunchy book to a young, blind student. Margaret Leslie tells it so well that tears of laughter fill your eyes. Finally we have an ageing, alcoholic Diva sung by Ali Davenport. She?s great and brings the night to an amusing end. Two costumes stand out ? the wedding dress and the Diva?s golden evening dress.